Every 15th of May is World Family Day. We live in an era in which families are different than in the past, their composition has changed but the importance of this social structure has not diminished. The aim of this day is to recognize families as the basic structure or unit of society. This day is used to raise awareness about the social, demographic and economic changes that affect families. Therefore, we encourage you to carry out activities in schools and at home with children to help them understand the significance of families. From Cokitos we like to promote the values of children, and the family is one of the most important. In addition, we believe that it has many other values associated with it, because it is the transmitter of knowledge and other values. Game of the family tree: learn in this game in Spanish the kinship between people of the family. 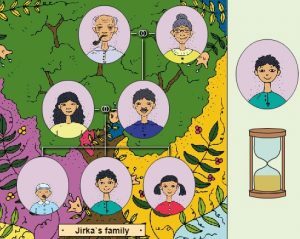 Genetics game: discover how genes work in families by analyzing the physical characteristics of characters. Family English kinship game, review the terms of family relationships or kinship with this simple game. Some families known to the children are the Pig family, Caillou, The Simpsons, and some groups of friends who behave more like family, such as Winnie the Pooh, the Canine Patrol or Mickey and his friends.